In early 2016 University Professor of Applied Physics Stephen Arnold earned a patent for his system for finding the size of one or more individual particles (such as nanoparticles) in real time using a microsphere's whispering gallery modes. Arnold and his team at Tandon's MicroParticle PhotoPhysics Laboratory for BioPhotonics (MP3L) had generated excitement throughout the scientific community in 2012, when they created an ultra-sensitive biosensor capable of identifying the smallest single virus particles in solution. Their technique was a major advance in a series of experiments to devise a diagnostic method sensitive enough to detect and a single virus particle in a doctor's office or field clinic, without the need for special assay preparations or conditions. Normally, such assessment required the virus to be measured in the vacuum environment of an electron microscope, which added time, complexity and considerable cost. Instead, the researchers were able to detect the smallest RNA virus particle MS2, with a mass of only 6 attograms, by amplifying the sensitivity of a biosensor. Within it, light from a tunable laser was guided down a fiber optic cable, where its intensity was measured by a detector on the far end. A small glass sphere was brought into contact with the fiber, diverting the light's path and causing it to orbit within the sphere. This change was recorded as a resonant dip in the transmission through the fiber. When a viral particle made contact with the sphere, it changed the sphere's properties, resulting in a detectable shift in resonance frequency. The smaller the particle, the harder it had been to record changes in the frequency. Fairly large viruses such as influenza had been successfully detected with similar sensors in the past. But many smaller viruses, such as polio, and antibody proteins required increased sensitivity. 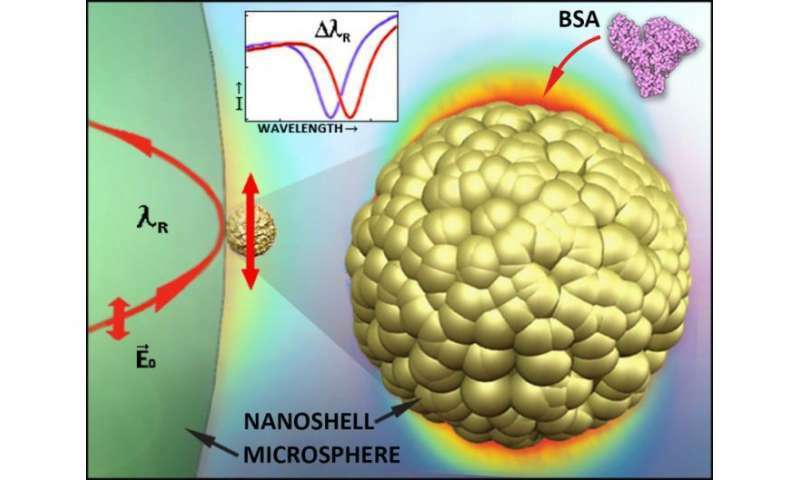 Arnold and his co-researchers achieved this by attaching gold nano-receptors to the resonant microsphere. These receptors were plasmonic and thus enhanced the electric field nearby, making small disturbances easier to detect. Each gold "hot spot" was treated with specific molecules, which attract and bind to proteins or viruses. Arnold explained that the inspiration for this breakthrough technique came to him during a concert by violinist Itzhak Perlman. He found himself wondering what would happen if a particle of dust landed on one of the strings. The frequency would change slightly, but the shift would be imperceptible. Then he began pondering what would result if the string held something sticky that would only respond to certain kinds of dust. The sensor, called a Whispering Gallery-Mode Biosensor, was unique to Arnold's work. Its name derived from the famous Whispering Gallery in the dome of St. Paul's Cathedral in London. Much the way its unique acoustics allow a whisper to be heard anywhere within the circular gallery, light traveling within the glass sphere of the biosensor orbits many times, ensuring nothing on the surface is missed. Just months after setting that record, Arnold and his team announced a new breakthrough: They used a nano-enhanced version of their patented microcavity biosensor to detect a single cancer marker protein, which is one-sixth the size of the smallest virus, and even smaller molecules below the mass of all known markers. This achievement shattered the previous record, setting a new benchmark for the most sensitive limit of detection. Unlike previous technology, which attached a fluorescent molecule, or label, to the antigen to allow it to be seen, Arnold's new process detected the antigen without an interfering label. Among other advances, Arnold and his colleagues note that the ability to follow a signal in real time—to actually witness the detection of a single disease marker protein and track its movement—is yielding new understanding of how proteins attach to antibodies. After those discoveries, Arnold participated in a 2014 seminar at the Max Planck Institute for the Science of Light, part of Germany's premier research institution for basic science. Devoted to biosensing at the very smallest extremes, the event drew members of the global scientific community who use the patented Whispering Gallery Mode Resonators for molecular diagnostics, single-molecule analysis, nanoparticle detection, and manipulation, as well as other forms of bio-sensing and various commercial and scientific applications. There was palpable excitement there at the possibility, raised by Arnold, of detecting nano-scale antibodies—produced by the body in reaction to invading viruses—well before existing medical tests could detect the virus itself. Among Arnold's recent journal papers are "Taking Microcavity Label-Free Single Molecule Detection Deep into the Protein Realm: Cancer Marker Detection at the Ultimate Sensitivity" (2015) and "Real-Time Size/Mass Spectrometry in Solution Using Whispering Gallery Micro-Global Positioning." In the latter paper, also from 2015, Arnold detailed his proof that real-time nanoparticle size/mass spectrometry by a microcavity in solution, which had been illusive for lack of binding position metrology, was not, in fact, subject to that limitation any longer.